The Roman Dominate started with the reign of Diocletian. Diocletian was a competent emperor. He ended the crisis, restored political stability and also ended the economic depression. To achieve political stability he created the Tetrarchy: he divided the Empire among four emperors or tetrarchs, two emperors in the West and two in the East. Diocletian himself was one of the emperors in the East. Galerius was the other emperor in the East and the two other emperors in the West were Flavius and Constantius. It is worth noting that Rome became again a true republic and was more democratic that it ever used to be during the Empire. It is also worth noting that Rome was no longer the capital of the Empire and that the capital became Mediolanum (today's Milan) from 286 to 330 AD. Diocletian also defeated barbarian tribes, removed the Persians from Syria and regained full control of this province. To achieve economic stability, Diocletian made several important tax reforms. Diocletian adopted a lot of the customs from the East, customs that were unusual in Rome. For example, people had to bowdown to him in his presence, a practice that was common in the eastern provinces but very unusual in Rome. He also wore jewelry (pearls) and wore golden sandals. Diocletian is also remembered for his persecution of the Christians. Christians were then seen as a threat to the political order. In 303 AD, Diocletian ordered that all Christians churches and scripts be destroyed. The practice of Christianity was punishable by death. Diocletian resigned in 305 AD, the first Roman emperor to ever do so. Constantine was one of the tetrarchs in 306 AD during the Roman Dominate. Quickly the empire lost the political stability that it had enjoyed during the reign of Diocletian. Constantine went to war with one of the other tetrarchs (Maxentius) and defeated him in 312 A.D.. He also went to war with tetrarch Licinius and defeated him in 324 A.D. thereby taking full control of the empire. Constantine also defeated the Franks and the Alamanni in 306-308 AD. Constantine is mainly remembered for converting Rome to Christianity. In 313 AD, the Edict of Milan allowed Christianity in the empire and now all Romans were free to practice this religion. It is worth noting however that other religions were allowed but that Christianity received preferential treatment and various privileges. Constantine converted to Christianity himself and even enforced the Christian faith throughout the Empire. Constantine also made a bold move: he changed the capital of the Empire. 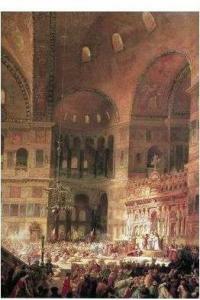 He rebuilt Byzantium, renamed it Nova Roma and made it the center of Christianity. The city however became quickly known as Constantinopole ("the city of Constantine" in Greek). Constantine made important changes as regards to the economy. Taxes were dramatically increased across the board but the currency the solidus became a stable currency and the economy began developing again. Towards the end of this dynasty, Rome lost some important battles. In 363, in the Battle of Samarra, the emperor Julian the Apostate lost against the Persians and was killed during the battle. Emperor Valens (reign: 364-378 AD) lost his life in the Battle of Adrianople in 378 AD against the Goths. This weakened the Empire during the Roman Dominate as the Goths were never expelled and never became integrated to Roman society. 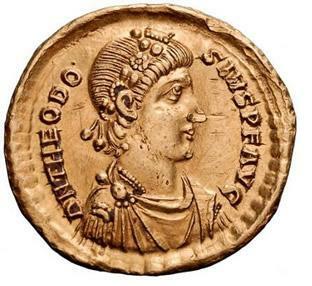 Theodosius (reign: 379-395 AD) gave more strength to Christianity and made it the official state religion. He also fortified the walls of Constantinople which made the city impenetrable until the 13th century. After his death, the empire was divided again into the Eastern and Western Roman Empire. The Eastern Empire was ruled by his son Arcadius (reign: 395-408 AD) and the Western Empire was ruled by his other son Honorius (reign: 395 - 423 AD). Ravenna became the capital of the Western Roman Empire in 402. General Stilicho (who had Vandal origins) was the regent for then underage emperor Honorius. General Stilicho had achieved many victories and wanted to reunite the empire. However, he was removed from power and exectured in 408 AD due in part to some major military disasters (and despite his previous military successes). His execution weakened the army and led to the Visigoth invasion and sack of Rome in 410 AD (noting however that Rome was no longer the capital). The Western Empire lost a lot of territory during the decades following General Stilicho's death. Britain was abandonned. The Visigoths conquered Gaul. Hispania was conquered by the Suebi and North Africa by the Vandals. There were also the invasions of Attila the Hun. It is worth noting that many of the barbarians had learned Rome's military tactics by enrolling in the Roman army and by fighting wars for Rome. There was actually a group of barbarians headed by Odoacer inside the Roman army that made some demands to Roman General Orestes. When the General refused to meet their demands and tried to expel them from Italy, Odoacer went to war with Orestes and killed him. He then invaded Ravenna in 476 AD and removed Romulus Augustus (son of Orestes) from power. 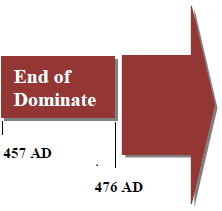 476 AD then marks the end of the Roman Dominate and of the Western Roman Empire.